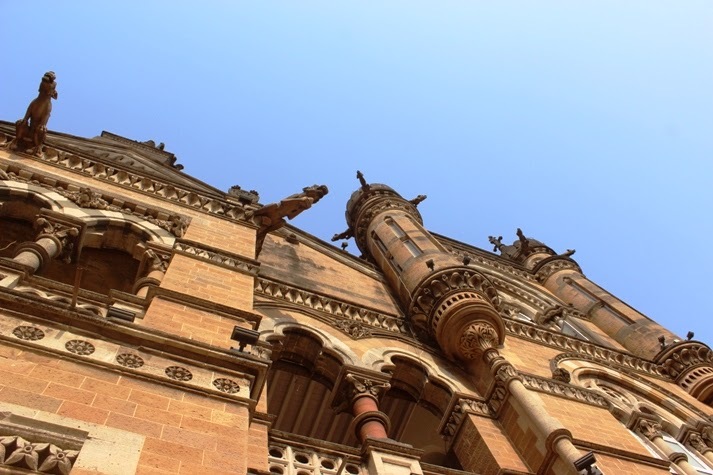 Recently, I went for the heritage tour of Chhatrapati Shivaji Terminus (CST). It was quite a sudden decision - I happened to be on a train heading home, when I thought of going on the tour. I got off the train, and took another one right back to CST! :) At the last minute I called my mom to join me too. I had to ask around a bit to find the start point. But eventually we found the entrance, and our tour began at 3:30 p.m. 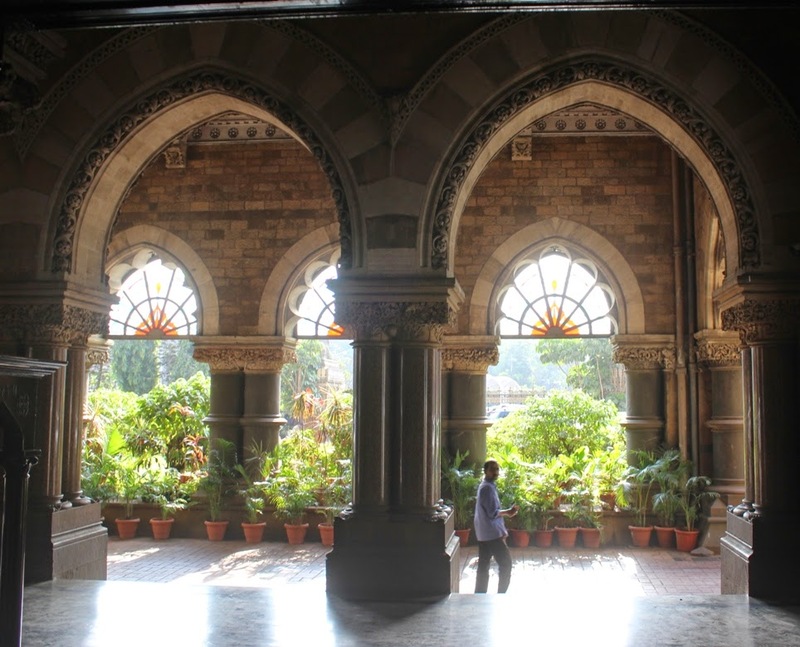 The tour took us through the Heritage Museum, the interiror of the Central Railway Headquarters building (where all the paperwork and government managerial stuff happens), and finally the station itself. The tour was led by Ms. Lata who was in charge of the place that day. She conducted our tour herself, as the usual guide (an architecture student) wasn't available then. 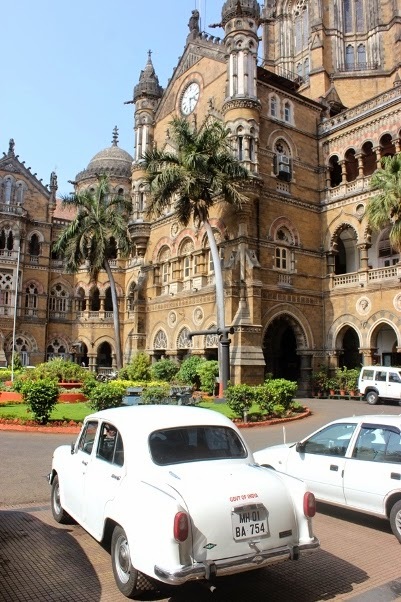 As we entered, we saw the facade of the Central Railway Headquarters, with the round carved heads of the 10 GIPR directors. 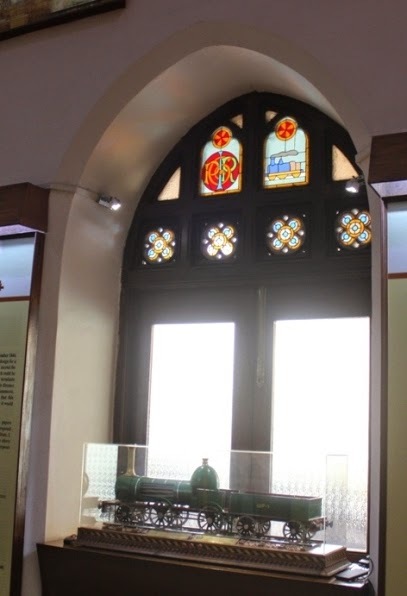 The Heritage Museum has displays on the history of Indian Railways, old engine types, etc. There are interesting old photos, models, letters, artifacts and objects. As a bonus, the museum is air-conditioned! Railway, the predecessor of the Central Railway. 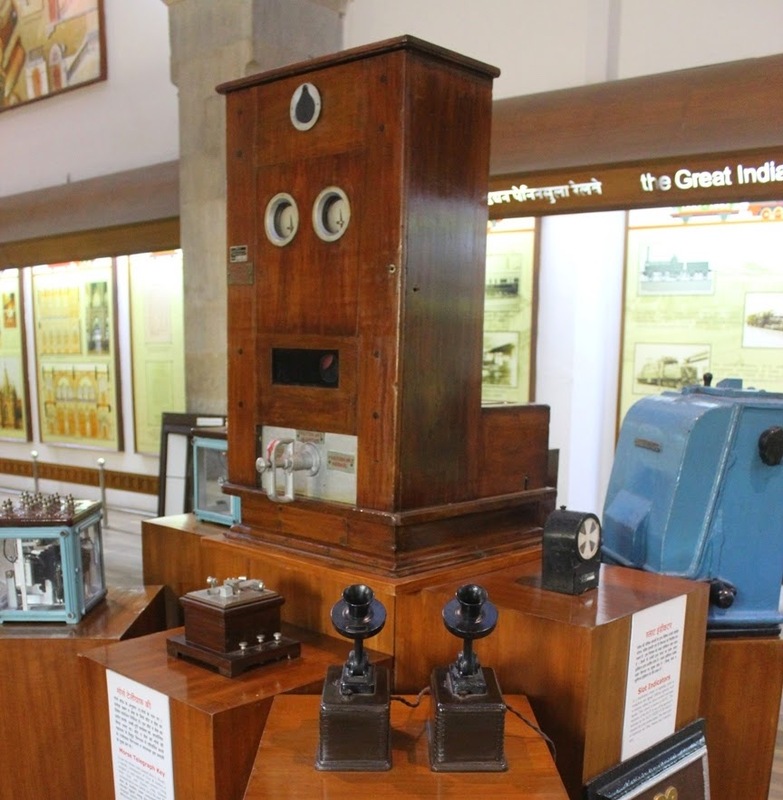 Some other interesting objects displayed were the Mangalore tiles with which the CST ceiling is made, an old money collection box (on which someone had put stickers, before it was rescued and placed in the museum), inkpots, teapots, cutlery, a slide rule, a range finder, and other instruments. 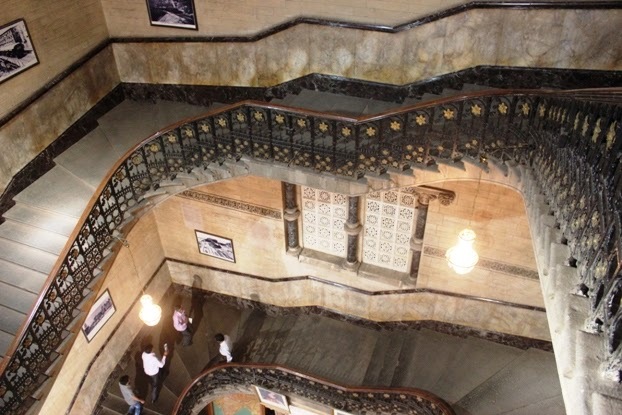 The Headquarters building is majestic: towering dome, winding staircase, high stained-glass windows, solid old wooden doors, and intricate stone carvings of animals, birds, plants and flowers. coat of arms of the Great Indian Peninsular Railway. ...and had tea and biscuits. This area is called the "Star Chamber" (notice the ceiling). Down below, people queue for tickets. We also went onto an open balcony. ... and the jutting gargoyles. We were also shown this grand dining room within the building. The luxurious dining room. Somehow this room took me by surprise - I wasn't expecting anything like it at all! In the dining room, there was also this wooden bookshelf packed with thick, official-looking gazettes and other publications on the railways. After visiting this last room, we said goodbye to Ms. Lata and left. All in all, I'm glad I went for the tour. 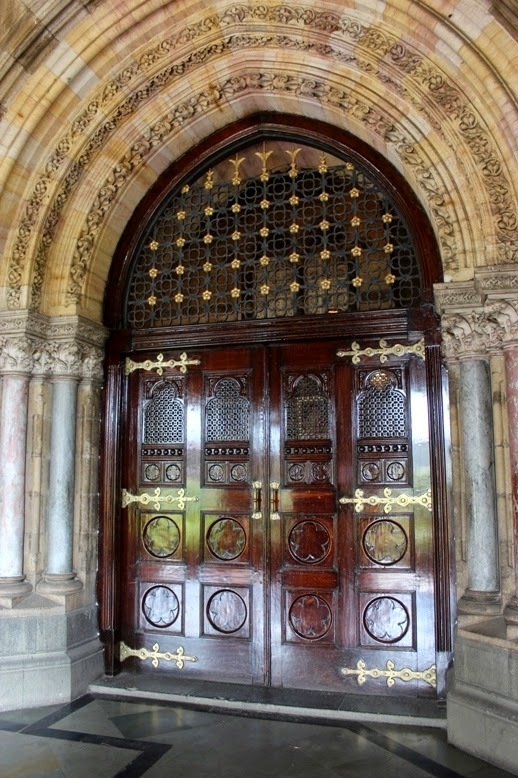 I got to see the gorgeous interiors of this building, that I had passed often but never entered before. 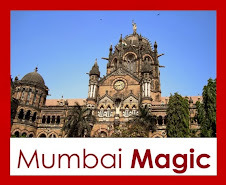 I also learnt quite a bit about the history of the railways, of CST, and of Mumbai. When, where, and how much does it cost? 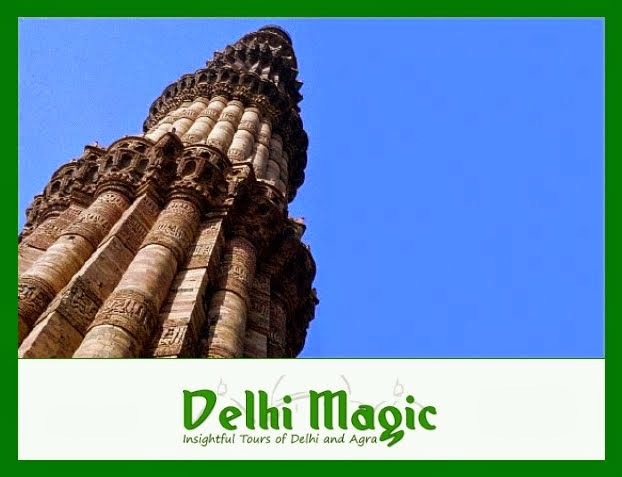 The tours are conducted between 3:00 PM and 6:00 PM, Monday to Friday. Tickets can be bought between 3:00 PM and 5:00 PM. Each tickets costs Rs. 200 normally, and Rs. 100 with student ID. 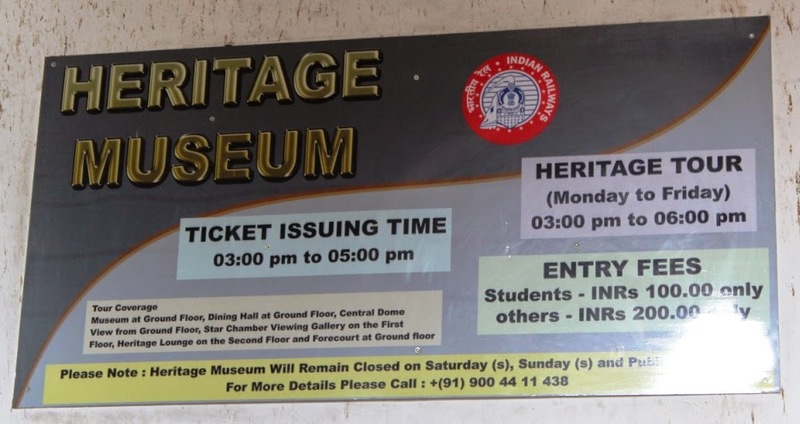 The ticket counter is at the Heritage Museum. 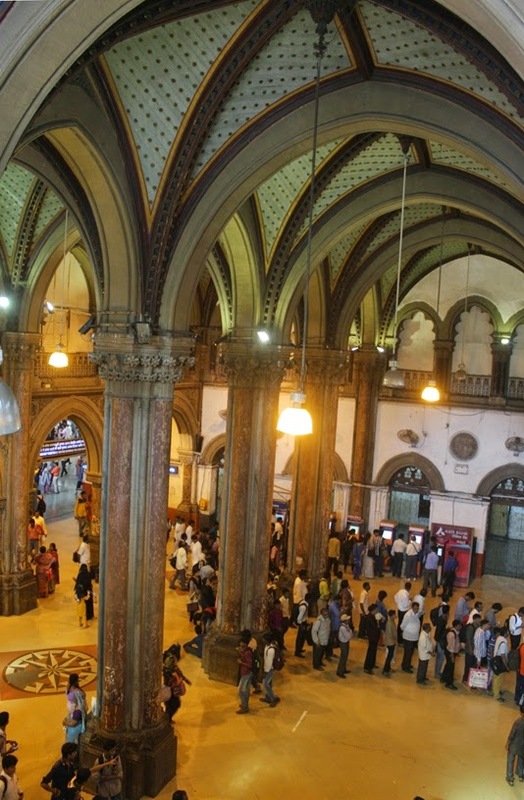 To reach the counter, there's no need to enter CST station. If you stand facing the Central Railway Headquarters, you'll see the main gate with two lions. Walk to your right and you'll see an arched entrance (photo below). This is the entrance to the Heritage Museum. 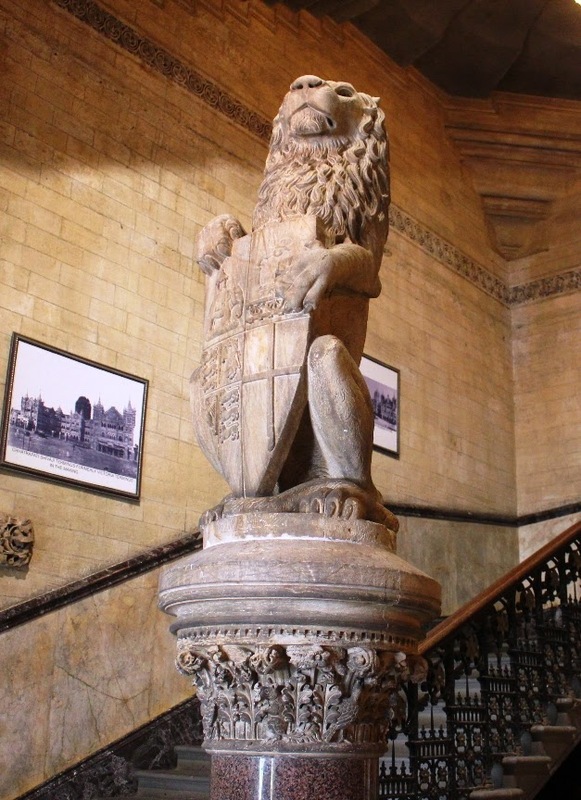 The lions at the gates of the Central Railway Headquarters. From the gates, walk towards the arch. The Heritage Museum is right under the arch. 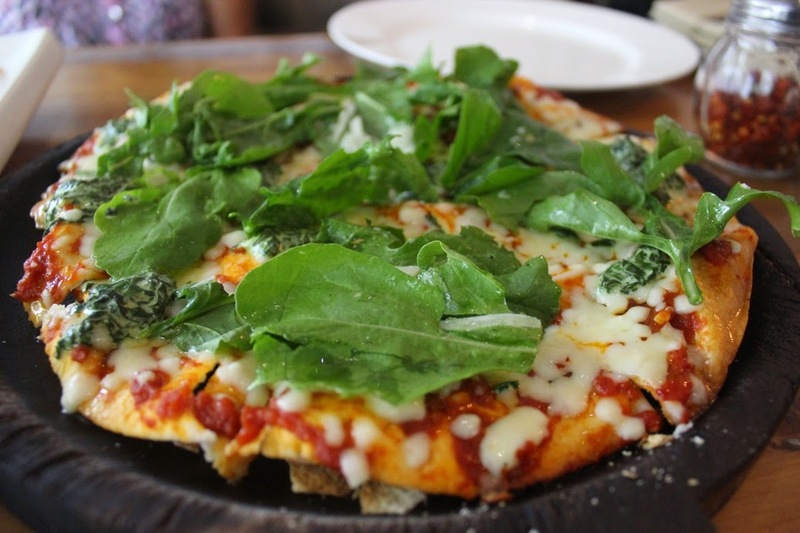 Shivaji Park finally got a nice place for super-thin crust pizza. Terttulia actually opened last year sometime in the monsoons. 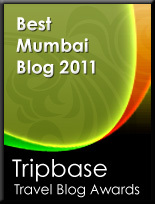 But I only made it there yesterday, when Vinita came to the office and we decided to go for an impromptu girl's lunch. The pizza was called Terttulia-aah! and it was excellent. Lots of arugula, just the way I like it. The lavash was also wafer thin and crisp, and the mezze dips were pretty good too. 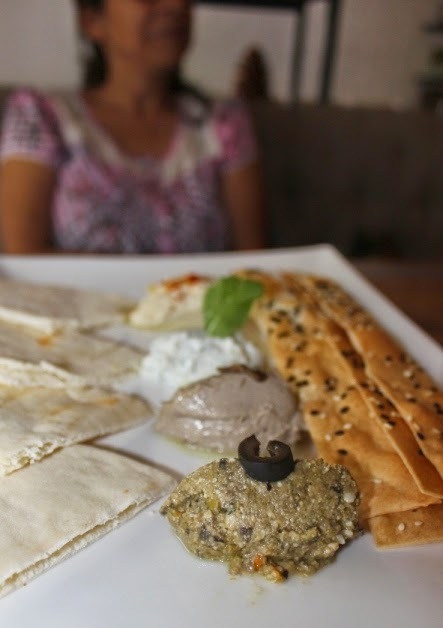 In the photo below, there are 4 dips - hummus, tzaziki (sp? ), mushroom pate and olive tapenade. Will go back again for certain. Very laid back and nice on a weekday afternoon. 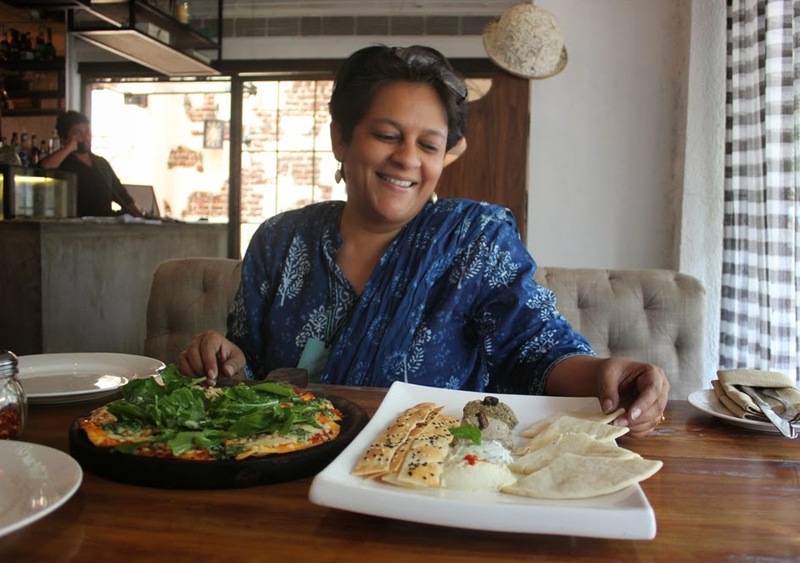 Vinita lives nearby and she tells me weekends are super-busy. So if you are going Sat/Sun, please call ahead and reserve. If you walk from Dadar Station to Hindmata, you'll come across this little khau-galli type scene. 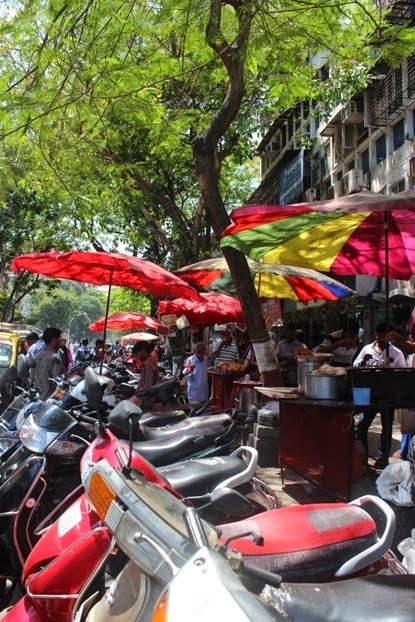 There are motorbikes and scooters parked in a row, and behind that, under the shade of some trees, you will see a series of bright umbrellas with food carts. In one of the stalls, there's a vada-pav seller. At first glance, he looks like any other vada-pav guy, selling batata-vada, palak-bhajji etc, but if you have a keen eye you'll soon spot his larger than usual batata-vadas (see them at the back?). 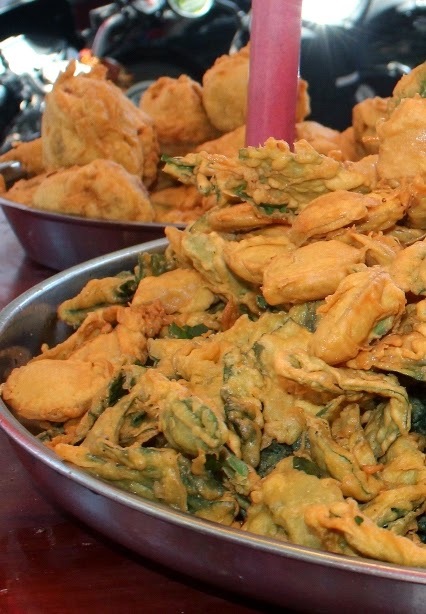 It turns out that those are not your regular batata-vadas at all. What they are, is Inside Out Vada-Paos. 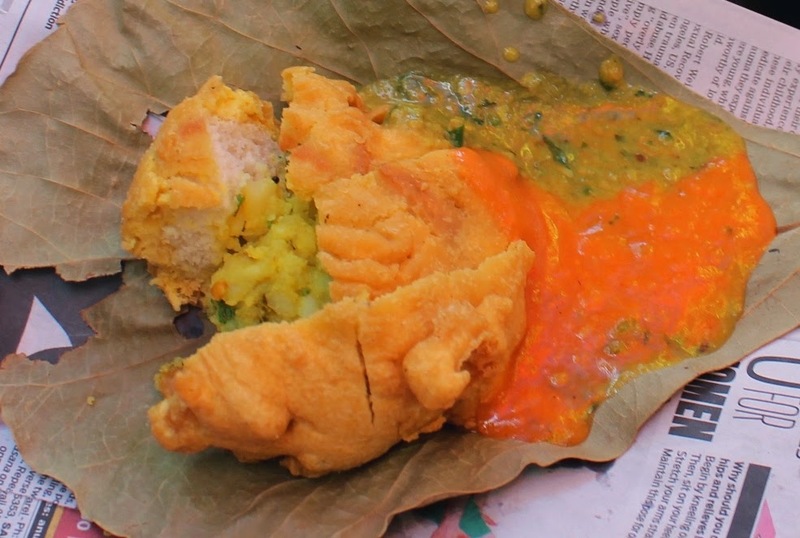 This little stall has flipped the regular vada-pao inside out. 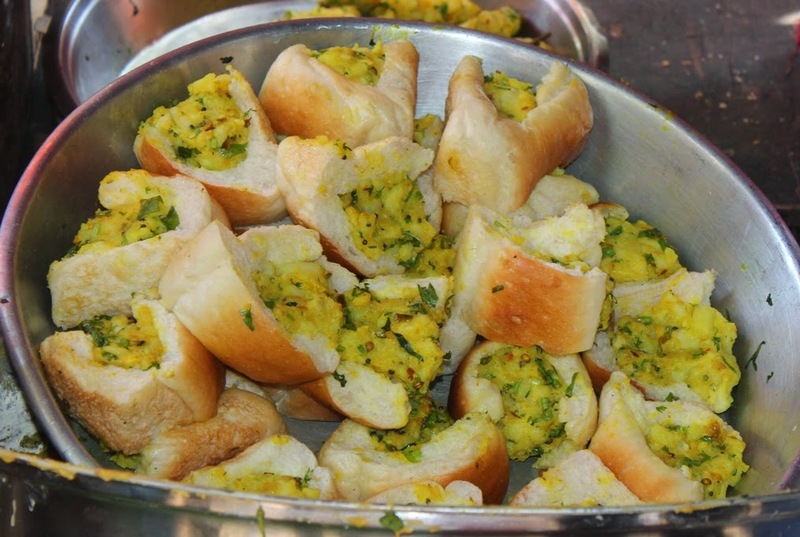 They've taken the batata-masala, and stuffed it inside a bun. Then they dip the bun in the batter and fry it.